The surrender of Ottoman Turkey on October 30, 1918, and the subsequent end of World War I in November, 1918, resulted in evacuation of regular troops of the defeated Central Powers from most of the Caucasus. However, in accordance with Clause 11 of the Mudros Armistice, the Turkish troops were allowed to occupy the territories of Batum and Kars left to the ottoman Empire by the Treaty of Brest-Litovsk for an indefinite period of time until and if ”demanded by the Allies after investigation”. At the same time, the Ottoman Ministry of War issued a special directive according to which thousands of Turkish officers and soldiers were unofficially left at the service of the republics of Azerbaijan and North Caucasus in order to keep them within the sphere of Turkish influence. The future of the self-proclaimed republics of the South Caucasus however, still remained unclear. The treaties of Brest-Litovsk and Batum were now both null and void thus allowing Armenia and Georgia to claim the territories previously lost to the Turks but at the same time, the recognition of Georgia, Armenia and Azerbaijan was withdrawn as well. The victorious allies initially tended to consider them as temporarily breakaway Russian territories but the development of the crisis situation in and around revolutionary Russia in combination with current inability of the two fallen empires to satisfy their ambitions in the region, gave the new nations of the South Caucasus a historical chance to establish/recover their statehood, and as early as in November 17 the allied command in the Middle East declared that the representatives of Britain, France and the USA were ready to establish relations with the de-facto governments of Armenia, Azerbaijan and Georgia. Besides the problem of diplomatic recognition accompanied by a variety of other political as well as economic problems, the period of nation-building in the South Caucasus was marked by territorial disputes and conflicting claims, that caused serious troubles for all the nations of the region not excluding Armenia. As of late October, 1918, the Democratic Republic of Armenia claimed a considerable part of the former Russian South Caucasus that included the whole of the province of Erevan, all the four districts of Kars territory, the counties of Akhalkalaki and Borchalo in the province of Tiflis and in the province of Elizavetpol – the whole Zanghezur county as well as mountainous parts of the counties of Elizavetpol, Javanshir, Karyaghino, Shusha and Kazakh (see Maps 2 and 3). The above claims were based on the principle of historical belonging of the above territories to ancient and early mediaeval Armenian states and on ethnic principle, since most of the territories in question had either Armenian majority or at least heavy presence of Armenians. Some of the Armenian elites also considered laying claims to the territory of Batum, so that landlocked Armenia could gain access to the sea. The Armenian territorial claims were in sharp conflict with the aspirations of Azerbaijan and Georgia, not to mention Turkey. The political elites of Azerbaijan were also basing their claims on both historical and ethnic principles. In terms of history they tended to disregard the earlier periods when the South Caucasus was dominated by Armenian and Georgian states but put an emphasis on the period that started from the late 14th century when the area was turned into the realm of Kara-Koyunlu and later of the Safavids both of whom they considered to be the fore-founders of modern Azerbaijan. Following the above principle, there was no place left for Armenia on the map at all. Even the tiny enclave left for the Armenians as per the Treaty of Batum, was according to the leadership of Azerbaijan inalienable part of their new-born country. As for the ethnic composition of the territory claimed by Armenia in the Caucasus, it would hardly be an exaggeration to say that most of it was also marked by heavy or significant presence of Turco-Tatars and other Muslim groups. The leaders of Georgia could base their territorial ambitions mainly on historical principle due to the fact that the counties of Borchalo and Akhalkalaki had little or no Georgian population at least by the beginning of the 20th century. 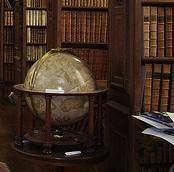 However, they were within the borders of the Georgian kingdom that was annexed by Russia in 1801 a few centuries prior to that. Thus from the point of view of Georgian elites as well as the majority of Georgian population, Georgia had both legal and moral right to leave the Russian Empire with all the lands it had contributed into it. Minimal claims of the Democratic Republic of Georgia in the area also alleged by Armenia included the whole of the province of Tiflis with the counties of Borchalo and Akhalkalaki and the districts of Ardahan and Oltu in Kars territory (see Map 3). From the point of view of Georgian government and historians, the above territories were unquestionable parts of Georgia due to the fact that in various periods of history they comprised historical Georgian provinces of Gogharena and later – Trialeti, Javakheti and Tashiri (Ahalkalaki and Borchalo counties), Samtskhe (Ardahan county) and Tao (Oltu county). Some Georgian politicians stretched their claims as far as the counties of Kazakh in the province of Elizavetpol and Alexandropol in the province of Erevan (see Map 3). From the point of view of Armenian leaders and intellectual elite though, the above territories were inalienable parts of historic Armenia due to the fact that some or all of the above territories belonged Armenia from 189 BC to 115 AD and were administered by Armenian governors between 1124 and 1240 AD. Armenians regarded the disputed territories as Armenian historical provinces of Javakh and Tayk. Although resting on more or less equally logical foundations the above mentioned territorial disputes in the South Caucasus led to a series of clashes and wars in 1918-1921. As a result, mutual dislike intensified in the area and the dragon’s teeth of a number of modern regional conflicts were sawn. 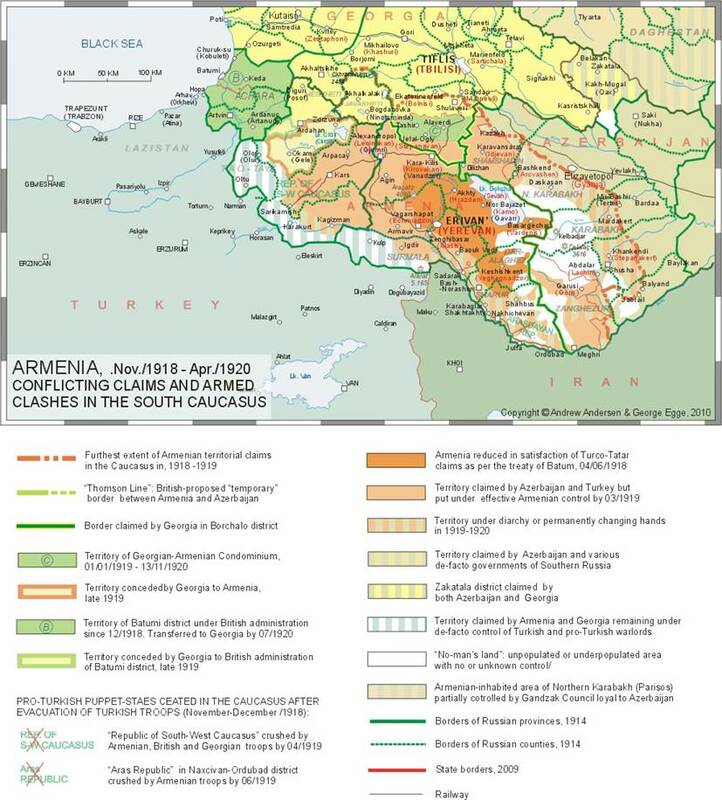 The first armed conflict between the two nations of the South Caucasus after the end of the Great War was presided by a series of armed clashes that occurred as early as October 18, 1918, two weeks before the capitulation of the Ottoman Empire when the Turkish forces already started evacuation and Armenian army units began taking over the territories claimed by the DRA government. On the above date, Armenian troops entered the Lori sector of the Borchalo county and clashed with the Georgian and German border guards near she railway station of Kober. The exchange of diplomatic notes that followed produced little effect, and the 9th of December, 1918, saw the outbreak of a real war between Armenia and Georgia with the use of heavy artillery, armored trains and combat aircrafts that lasted only 22 days but had quite harmful consequences for the two forming nations. The first three weeks of the war were marked by Armenian offensive in the directions of Tiflis and Vorontsovka as well as some maneuvers near Akhalkalaki accompanied with uprisings in several Armenian-inhabited communities in the county of Borchalo. The Georgian counter-offensive that followed and the mediation on behalf of British and French missions resulted in the ceasefire of January 1, 1919 and a provisional agreement signed on January 17 in accordance with which Armenia gained only a tiny strip in the south of Lori sector of the Borchalo county whereas the rest of the sector was turned into British-occupied Georgian-Armenian Condominium. One of the provisions of the treaty was that the final resolution of the conflict was to take place at the Paris Peace Conference together with final border delimitation between Armenia and Georgia. The Armenian government also dropped their claims over Akhalkalaki county. As of today, most of the historians who researched that conflict agree that Georgian-Armenian war of December/1918 severely damaged the reputation of the two nations and diminished their chances for success at the Paris Peace Conference. While having ended the war the agreement on Lori sector left both parties unsatisfied and ended in permanent strain between the two governments and severe transportation problem between the two countries that put Armenia into almost full isolation. One should add to the above that Georgian-Armenian war of 1918-1919 drew military forces of both nations away from other important directions. That resulted in Georgian territorial losses in Sochi district at the Black Sea coast and delayed Armenian takeover of Nakhichevan. 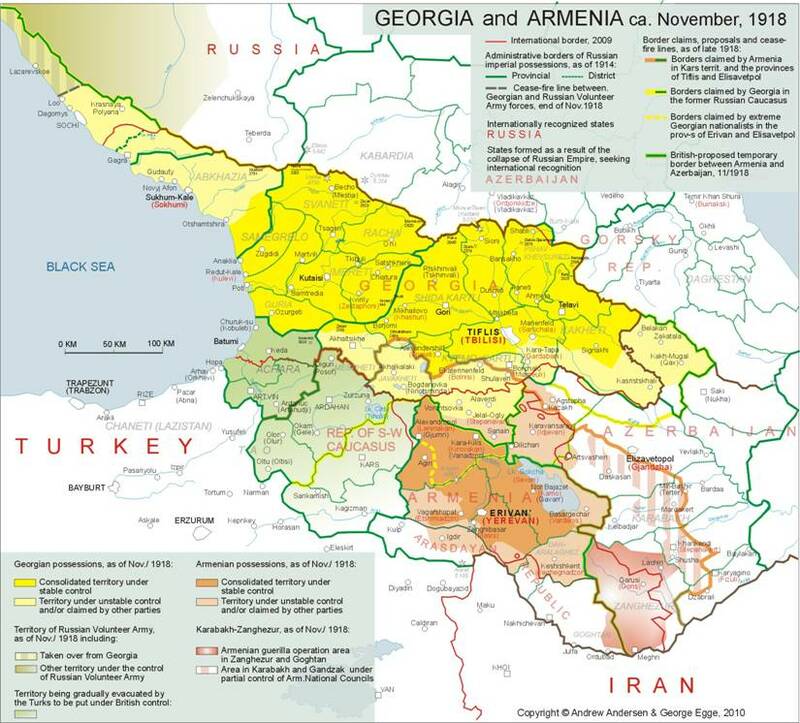 The relationship between Armenia and Georgia although strained as a result of the December War, would look almost ideal if compared with what was happening at the same time between Armenia and Muslim (Turco-Tatar) state formations of the South Caucasus. On the 11th of November, 1918 Jevad Pasha received a communiqué from British Commander in Chief in the Mediterranean, Vice Admiral Gough-Calthorpe containing an unequivocal demand of the Supreme Allied War Council to clear completely all the occupied territories of the Caucasus including the territories of Kars and Batum where some 50 000 Turkish troops were still stationed after Mudros. The Ottoman reaction was slow and the tactics of delaying was adopted in order to postpone evacuation of the above territories. After long negotiations the Turkidh 9th Army under Shevki Pasha was allowed to stay in Kars up until January 25, 1919 whereas the transfer of the Kars territory to Armenia was to begin no later than January 15. While formally accepting the demands of the victorious allies the Turks took certain measures to keep Kars and some other territories around it within the sphere of Turkish dominance just like it was dome in Azerbaijan, Daghestan and other areas they had taken over by the end of summer, 1918 and were to leave after Mudros. Not only numerous Turkish officers were left behind as instruvctors but the whole units of the 9th Army were only cosmetically re-uniformed in order to look more like local militia and in order to prevent Armenian and Georgian takeover in the territories of Kars and Batum. The evacuating Ottoman administration was also quite successful in the establishment of a few puppet governments in the former Russian areas of the South-Western Caucasus that would attempt to stay in close connection and possibly even alliance with Turkey. One of the new state formations of that kind was the South-West Caucasian Republic (SWCR) created in Kars shortly after Mudros. The pro-Turkish government of Fakhreddin (Erdoghan) Pirioglu formed in Kars on November 5, 1918, claimed effective control not only over the four districts of Kars territory but also over all the former Russian territories annexed by Turkey as per the Treaty of Batum including but not limiting to Nakhichevan and Alexandropol counties of the province of Erevan, the counties of Akhaltsikhe and Akhalkalaki in the province of Tiflis and Batum territory (former Batum district of the province of Kutais) (see Map 3). The Kars government rejected both Armenian and Georgian authority and rather effectively exploited the principle of self-determination declared by the USA, Britain and France. Indeed the SWCR enjoyed some favor on behalf of the British mission in the Caucasus. The British troops even blocked the roads leading to Kars from the province of Erevan and prevented some 100 000 Armenian refugees from returning to their homes. At the same time the Azerbaijani government of Khan Khoisky tried to urge British approval for at least temporary annexation of the SWCR territory by the Republic of Azerbaijan. The sympathies of allies turned around in early February of the year 1919 when the paramilitary forces of SWCR under the command Server Beg invaded Georgian-controlled counties of Akhaltsikhe and Akhalkalaki in order to expand the Kars-controlled territory. Following the counter-offensive of the Georgian army of early April, 1919 the British troops already stationed in the province of Erevan entered Kars on April 6-9. On April 10, 1919, the SWCR leaders were arrested and deported whilenine days later, the city of Kars was handed to the Armenian governor. By April 22, the Georgians completely crushed the resistance of Server Beg’s paramilitaries in the county of Akhaltsikhe and the district of Ardahan and put both counties under their control. The South-West Caucasian Republic was abolished, and the districts of Kars and Sarykamysh were annexed by the Democratic Republic of Armenia while the county of Ardahan was taken over by Georgia. The British command in the Caucasus did not allow either Georgian or Armenian troops to enter the territory that included the district of Oltu (Olti) which was claimed by both nations and the sector of Karaqurt claimed by Armenia leaving it in the hands of local Muslim chieftains until it was once again taken over by the Turks during the Turkish-Armenian war of late 1920. A few months later Georgia conceded part of the district of Ardahan (Okam sector and most of Chyldyr sector) to Armenia (see Maps 2 and 4). Mutual territorial claims of Armenia and Azerbaijan led to the series of brutal wars accompanied by periodical massacres of civilians in the disputed area that included Kazakh-Shamshadin, Nakhichevan, Zanghezur and Karabakh. The first hostilities in the above and other areas with mixed population occurred as early as the spring of 1918, when the South Caucasus was invaded by the Ottoman armies to end in 1921 only. As has already been mentioned above, Armenian nationalists believed that the reviving Armenian state was to include among other territories, the whole of Erevan province including the counties of Surmala, Nakhichevan and Sharur-Daralaghes, as well as the western and southern parts of Elizavetpol province (historical Armenian lands of Syuniq, Dizaq, Varanda, Khachen, Jraberd, Gyulistan and Parisos). That point of view went back to the ancient and early mediaeval periods of Armenian history when the above-mentioned territories formed parts of the greater Armenia and later smaller Armenian states. It was also supported by numerous examples of ancient Armenian architecture (mostly churches and their ruins as well as the khachkars) scattered all over the disputed area. The above approach made absolutely no sense to the Tatar nationalists and pan-turanists of Azerbaijan. According to their views, there was absolutely no territory in the Caucasus to which Armenian people had any legal or even historical right. The politicians and the majority of the intellectual elite of the new-formed Azerbaijan Democratic Republic based their opinions on the fact that Armenian statehood in South Caucasus ceased to exist in 1081 when it was overrun by the Seljuk Turks coming from Central Asia. The mass migrations of population and numerous massacres that followed left most of the historical Armenian lands populated by Turcic-speaking and/or Muslim majority and run by Muslim/Turcic rulers. The Armenians became minority in the land they claimed theirs and with some exceptions could boast only “significant Armenian presence” in some areas of the South Caucasus and Eastern Turkey. Tatar nationalists also considered “extreme generosity” the fact that Turkey and Azerbaijan agreed in Batum in June of 1918, to “tolerate” Armenian national homeland in Erevan and Echmiadzin counties of the former Erevan province. As a result of the above conflicting views, neither Armenia nor Azerbaijan could be satisfied with the “temporary” border proposal made in late November 1918, by Major-General William M. Thomson, the commander of the British expeditionary forces that started the occupation of the South Caucasus on 17 November 17, 1918. According to General Thomson, the just settlement in all disputed areas of the Caucasus was to be brought by the world peace conference in Paris. Meanwhile the Armenian claims against Azerbaijan were not supposed to go beyond the northern and eastern borders of the former Erevan province, while Azerbaijan was to be limited to the provinces of Baku and Elizavetpol (Gyanja) (see Maps 3 and 4 ). The government of Armenia was not prepared to drop their claims to Kazakh-Shamshadin, Zanghezur and Karabakh while Azerbaijan was not accepting the idea of Armenian control over Surmala and Nakhichevan - Ordubad. To make things worse, the masses of population of a number of territories assigned to Armenia and Azerbaijan were not prepared to consider themselves a part of the republics to which they were assigned by Thomson. Thus the fragile peace with an unresolved territorial dispute at its background could not last for too long, and the series of Azeri-Armenian wars broke out both in the provinces of Erevan and Elizavetpol as early as at the end of 1918. Contrary to Armenian aspirations and hopes for special treatment following their uninterrupted loyalty to the Allies throughout the whole of the Great War, the British Command in the South Caucasus decided in the late fall of 1918, to leave the Karabakh-Zanghezur area under the jurisdiction of oil-rich Azerbaijan at least until the moment when the final delimitation agreement would be reached at the Paris peace Conference. That led to a fragile diarchy in the Armenian-populated parts of Karabakh where the Erevan-oriented People’s Government in Shusha that had been running the area since July 1918, was forced to share its power with the British appointee Dr. Khosrow Bek Sultanov who was given authority by Thomson to run a considerable part (4 of 8 counties) of the province of Elisavetpol including Mountaineous Karabakh and Zanghezur(see Map.4). The following 8 months in Mountainous Karabakh were marked with the total failure of cooperation between consecutive Armenian Assemblies and Sultanov as well as with the non-stopping ethnic conflicts that led to armed clashes between local Armenian self-defense forces and the regular army of Azerbaijan that included some 3000 Turkish troops still stationed in the area and were assisted by armed militias recruited from Tatar and Kurd nomads of western Karabakh. At the same period of time, almost the whole county of Zanghezur was under stable control of Armenian military units and formations of general Andranik who being formally disloyal to the government in Erevan, felt quite free to act independently and crashed all attempts of the regular armies of Turkey and Azerbaijan to put Zanghezur under their control. Following the armistice of Mudros and an appeal from the Armenian-controlled part of Karabakh, Andranik sent his “Special Striking Division” out toward Shusha on November 29, 1918. After three days of fierce fighting against Azeri-Kurd irregulars for a narrow strip of land separating Armenian-controlled parts of Zanghezur and Karabakh Andranik’s men had the way to the heartland of Karabakh unobstructed. However, an urgent message from Major General Thomson received by Andranik on December 03 contained an unequivocal order to move back to Zanghezur and to refrain from taking any disputed territory by force until the decision of the peace conference. Andranik submitted and stepped down as a commander of the Armenian forces in Zanghezur while Muslim militias wiped out all remaining Armenian settlements connecting Karabakh with Zanghezur. Despite repeatedly expressed aspirations of the Karabakh Armenians for unification with Armenia, the government of the First Republic in Erevan was reluctant to insist on immediate annexation of Mountainous Karabakh rather leaning towards the creation of a buffer state in the areas with mixed population east of Zanghezur. Finally, on August 22, 1919, after long negotiations, an agreement was reached in Shusha between the Seventh Assembly of Karabakh (Armenian-dominated) and Sultanov in accordance with which Mountainous Karabakh (but not Zanghezur) was to remain temporarily within Azerbaijan until the final resolution of the conflict at the Paris Peace Conference. In the county of Zanghezur that in accordance with the initial plans of Thomson was to be included into the special governorate of Karabakh run by Khosrow Bek Sultanov, the situation was different. After disappointed with the British Major General Andranik stepped down as a commander of all Armenian forces in Zanghezur on March 22, 1919, local Armenian field commanders refused to submit to the British dictate. After being pressed by British representatives they expressed their preparedness to fight to the end against any power that would attempt to submit them to Azerbaijan including Britain and France, Thomson agreed to exclude Zanghezur from the list of ethnically diverse counties “temporarily” granted to Azerbaijan. The government of Azerbaijani Republic was informed on that concession on May 29, 1919. By that time the Armenian militias of Zanghezur destroyed rebellious Muslim communities in the central areas of the county and expelled them to the periphery. In addition to the five major historical districts of Karabakh (Gyulistan, Khachen, Jraberd, Varanda and Dizak) there is another area sometimes included into the disputed historical province. That is the mountainous part of the Elizavetpol (Gyanja) county. The smaller part of this area The smaller part of the described area south of the village of Chaykend and north of Inja river (which also served as a border between the counties of Elizavetpol and Javanshir) that embraced a group of ethnic Armenian settlements forming a triangle with apexes in the villages of Karachinar, Enghikend and Gyulistan, is the continuation of historical Gyulistan whereas the remaining part of that mountainous territory predominantly Armenian-inhabited until 1989, is referred to by various historical geographers and politicians as Northern Karabakh, North-Western Karabakh or Parisos. The Armenian communities of Parisos were not represented at the Karabakh Assemblies (unlike those of Gyulistan). Instead they were administered by the Armenian National Council of Gandzak in Gyanja that in turn, demonstrated loyalty to Turkey during Ottoman occupation and later – to Azerbaijan to the extent that two of the Council members were selected to represent the area in the Azerbaijani Parliament. One should add to the above that there was a considerable no-man’s land between Armenia and Azerbaijan in the upper flow of the river Terter and around the mountains of Omar, Gyamysh, Jinaldagh, Delidagh, Klyshdagh and Sarychly. It embraced south-western part of the county of Gyanja, eastern part of Javanshir county and northernmost Zanghezur. Having no infrastructure that mountainous area had almost no population except a few nomadic tribes (predominantly Kurds relatively loyal to Azerbaijan) that used to be present in the area in summer only and moved down to the lower Karabakh in winter together with their livestock. During the period between the fall of 1918 and the spring of 1920, the above-described area was claimed by both Azerbaijan and Armenia but hardly any of the conflicting parties could boast an effective control over it until the Soviet takeover in May, 1920. Sharur, Nakhichevan and Goghtan, 01/1919 - 06/1919. Following the decision of British occupational authorities to secure provisional Armenian rule in the southern areas of the Erevan province (Sharur and the county of Nakhichevan) the government of the First Republic was prepared to take over those rich lands the importance of which was increased by their geographic position that would secure Armenian access to Persia (Iran). Those Armenian plans were in sharp conflict with the aspirations of the local Muslim (predominantly Turco-Tatar) population that was forming absolute majority in the disputed area since the ethnic cleansings of 1918. Nevertheless, in mid-December of 1918, there were enough Armenian troops stationed south of Erevan to take over Sharur and Nakhichevan while local Tatar militias despite some Turkish support were not prepared to resist Armenian expansion. However, the takeover of the southern areas of the Erevan province was put on hold by Armenian command due to the eruption of Georgian-Armenian war (see above) up until January, 1919. The delay proved crucial. By that moment the pan-Turanist “Arasdayan Republic” was proclaimed in the disputed area and local anti-Armenian forces were armed and organized well enough to repel or at least slow down possible Armenian expansion. The eruption of a new war was this time prevented through Allied mediation and establishment of a special British governorship on January 26, 1919. The new British protectorate embraced most of the county of Nakhichevan (excluding the mountainous area) all of Sharur and even some 30% of the county of Erevan up till the river of Vedichay. Although the area was excluded from the Armenian republic, the British governorship put an end to the “Arasdayan Republic” leaving most of the real administrative power to Japhar-Kouli Khan of Nakhichevan with the police functions performed by a small British contingent. The spring of 1919 saw the reversal of British sympathies for Muslim aspirations in the some areas of the South Caucasus. The analysis of the reasons of such a reversal would go far beyond the framework of this article. Here we can only mention that after a series of talks performed by British emissaries in Tiflis, Erevan, Baku and Nakhichevan the allied governorship was abolished and the British units stationed in the area were to be replaced Armenian troops under General Dro (Drastamat Kanayan). On May 16, 1919, the whole of Sharur, Nakhichevan and Goghtan were put under formal Armenian control and By June 7 the last British units left the disputed area. 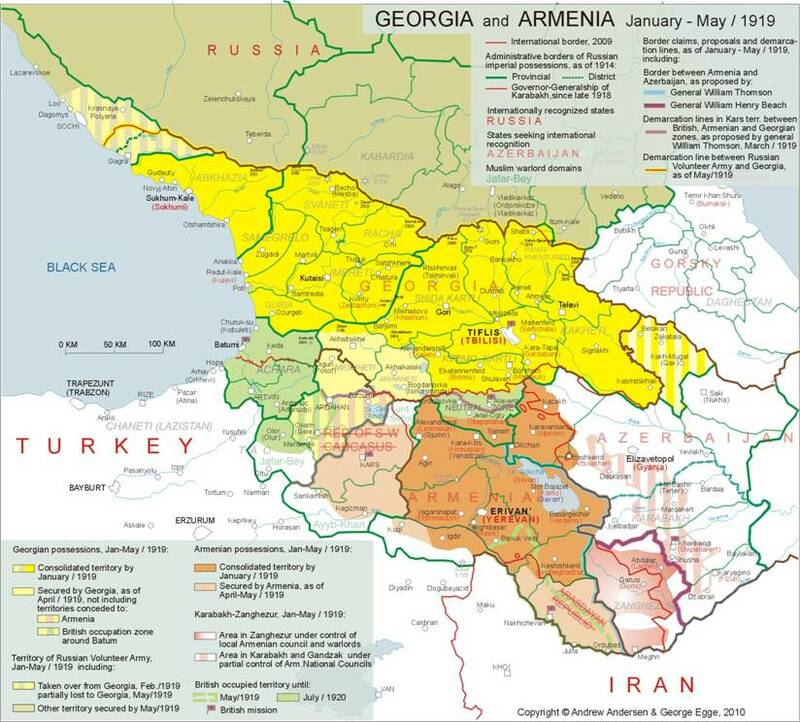 Thus by the beginning of the summer of 1919, the First Armenian Republic managed to put under her formal control most o the territory that could be called “the former Russian Armenia” with the exception of the Mountainous Karabakh (see Map 5). 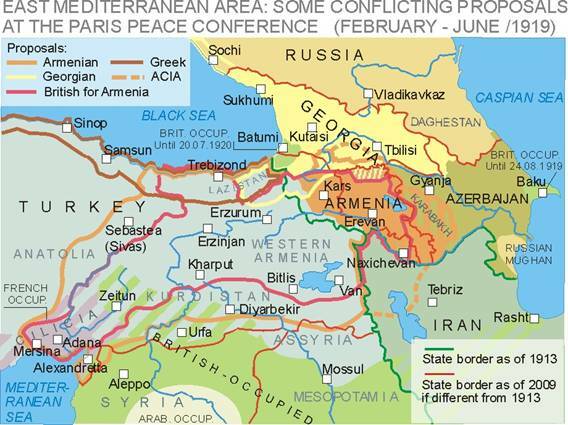 The temporary borders of Armenia were reflected on the map prepared for presentation at the Peace Conference in Paris by British Brigadier General William Henry Beach. According to that map Armenia included most of the Kars territory as well as all of the province of Erevan (including Sharur, Nakhichevan and Goghtan) and the county of Zanghezur. The map of Beach is a document of specially interest keeping in mind that until April, 1919, its author (the head of the British military intelligence in the Caucasus) was known as a strong advocate of the inclusion of the counties of Zanghezur and Nakhichevan into Azerbaijan. Nevertheless, in the early summer of 1919 neither Armenian, nor Azerbaijani governments and elites believed that the territorial dispute was over. The events that followed confirmed that the status quo in the South Caucasus was quite fragile. During the spring and early summer of 1919 when the re-born Armenian state in the South Caucasus was trying to establish firmly in the former Erevan province and Kars territory as well as in Zanghezur and some other lands, the Armenian question was actively discussed at the Paris Peace Conference. While at least in early February, 1919, the delegation from Armenian Republic tried to be more pragmatic and restrict its claims to the former Russian and partially, Turkish Armenia adding to it a part of the vilayet of Trebizond in order to get access to the Black Sea, the National Delegation voiced far more ambitious territorial claims aimed at the creation of a vast Armenian state that would stretch itself from Black Sea to Mediterranean coast and from the Caucasus to the Taurus and would include Cilicia where local Armenian communities tried to build-up some self-government under the protection of French civil administration and a small allied military contingent. According to Loris-Melikov, the delegation headed by Nubar was firm in its claims partially due to the influence of Russian anticommunist diplomats including Sazonov, who strongly believed in the soon fall of the Soviet regime and re-unification of Armenia with Russia that would thus give Russia an access to the Mediterranean ports of Adana, Mersina and Alexandretta. Seven eastern vilayets of the Ottoman Empire: Bitlis, Diyarbekir, Erzerum, Kharput, Sivas, Trebizond and Van (The vilayet of Trebizond was added to the traditional six in order to get access to the Black Sea) excluding historically non-Armenian districts south of the Tigris tributaries and west of Ordu-Sivas line. The four sanjaks of Cilicia: Marash, Khozan, Jebel-Bereket and Adana, plus the town of Alexandretta. The Armenian proposal was identical to that of the American Committee for the Independence of Armenia (ACIA) that was lobbying Armenian interests in the US Congress and enjoyed support on behalf of President Woodrow Wilson. At the very last moment the united Armenian delegation agreed on the excluding an area around Maku in north-western corner of Iranian Azerbaijan (historical Armenian province of Artaz) from the above proposal in order to maintain good relations with the neutral Persia (Iran). While recognizing both the substantive input of Armenia in the Great War and the victims of the Armenian people, most of the leaders of the Allied powers considered Armenian aspirations rather excessive if not colossal. They agreed that Turkey had to surrender all of her territorial claims to the Caucasus but were not sure what part of Turkish Armenia could be awarded to the Armenian Republic providing the absence of the Armenian population there following the massacres of 1915 and 1918. The British delegation at the Peace Conference recommended rounding off the prospective Armenian gains in the seven vilayets while at the same time restricting the Caucasian possessions of Armenia to the province of Erevan and most of the territory of Kars. The French delegation was firm in claiming Cilicia and advocating its future incorporation into Syria. Finally, the Armenian aspirations in the vilayet of Trebizond (also known as Paryadria or Lazistan) were in conflict with the doctrine of the government of Greece (Megali idea) as well as of various Pontic Greek organizations that considered restoration of a Pontic Greek state with the centre in Trebizond as well as with the aspirations of Georgia also claiming part of Turkish Black Sea coast and some land in the basin of Chorokh. Finally though, the Greek government of Eleutherios Venizelos revoked any claims to Trebizond in favor of a prospective Armeno-Greek federation whereas Georgian claims were to some extent supported by Britain. Despite there differences in the approach to the Armenian question the leaders of the USA, Britain and France were unanimous in their belief that the new Armenian state was incapable of fully independent sovereign existence and thus needed to be placed under mandate of one of the major victorious powers. Keeping in mind that both Britain and France refused mandate for Armenia the only two remaining powers capable of taking care of the vast prospective state were Italy and the USA. The Armenian hopes definitely lay with the Americans and the US President Woodrow Wilson who was one of the major advocates of Armenian aspirations. However, President Wilson needed time to convince the US Congress that Armenian project was worth the efforts and investments. As a result of the above, the final decisions regarding the peace treaty with Turkey and the future of Armenia was deferred for at least two months by the decision of the Council of Four that was confirmed by a number of documents signed between May 13 and June 25, 1919. That was a big diplomatic defeat of Armenia. The country remained officially unrecognized, and after the end of the first phase of the Peace Conference the Allied leaders were never again to join together as a single body, and the golden opportunity to approach all of them at the same time in order to resolve the Armenian question slipped away in early summer of 1919. M. Varandian, Le conflit armeno-georgien et la guerre du Caucase (Paris, 1919), p.75. belogvardejcev: Denikin-Yudenich-Wrangel (Moscow, 1927), p. 92. Tadeusz Swietochowski, Russia and Azerbaijan: A Borderland in Transition (NY, 1995), p.76. Vol. 3 (2007), pp. 46-48. Ibid., pp. 231 and 234. That quazi-state formation proclaimed in December,1918, was closely connected with Turkey, claimed not only the county of Nakhichevan, but also Sharur-Daralaghez, Surmala and south-western parts of the counties of Erevan and Echmiadzin that had been annexed by the Ottoman Empire in June, 1918 (Auth).